The short story, “Catherine, the Faithful Ojibway”, is a love story that recounts the fatal feelings that an Ojibway woman and British fur trader develop for one another during an incredibly tense time between the two races. The short story is prefaced with “The Song of Hiawatha”, a poem by Henry Wadsworth Longfellow written in 1855. Longfellow based this legend poem off of the Ojibwe tribe, using many of their own legends and trickster characters. The poem is set the in lakes of northern Wisconsin and Michigan, where Waterman’s story also takes place. The poem heavily foreshadows the events of Waterman’s short story not only through setting but also through plot, as a large portion of “The Song of Hiawartha” is based on an Ojibwe man falling in love with a white woman, who is actually a dandelion. Several pages later, we are able to draw comparisons between the couple in Longfellow’s song and the one in the short story, which is comprised of a British man who falls in love with an Ojibwe woman. The segment of the poem chosen to preface the story asks the audience what the territory of the Ojibwe people is in the eyes of the reader. 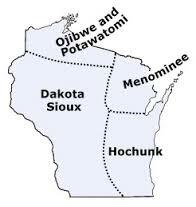 The answer to this question gives a beautiful description of the mountainous region in which the Ojibwe’s lived peacefully long before the invasion of any other men, and the serenity that came with the land. It seems as though this segment of the poem serves as foreshadowing of the events that unfold in the story. Much of the story has to do with the tension that builds between the newly settled British invaders after their defeat of the French, and the oppression that they look to impose on the Native People. The poem serves as a way to visualize what, in spirit and in actuality, what the land of the Ojibwe’s means to them as means of survival, religion, history, and beauty. Yet another aspect of this short story that can be read and interpreted critically comes on the same page as the preface, when the narrator introduces the protagonist, Catherine, and explains the personal significance of the story. The Ojibway author who possesses this story, which was spoken from his great-grandfather, explains that this story is the last remaining piece of his cultural history and identity. He argues that his great-grandfather barely held on to the story after losing his entire Native-American identity to white institutions and assimilation such as his time at the Carlisle Indian School, stripping him of his traditions and ways of life. Although the narrator still has this story, it is all that is left of his family. It can be assumed that Waterman, author of this fictional story and former student of the same school, identifies with the narrator in the way of lost identity, and uses his fiction to turn an unreal accusation towards the Carlisle Indian School into a reality. As the story continues, we watch the two protagonists fall in love after Gladwyn, a British soldier invading the northwest, accidentally comes across the love of his life, Catharine, a young Ojibway woman whose family has been living on the Ojibway territory for years. As their love grows, so does their ability to use each other as resources of trade and commodities, as Catherine makes delicately crafted Moccasins that are sold and traded at posts controlled by the British. In return, Catherine herself receives food, care, and shelter from Gladwyn, as well as a feeling of approval and rapport between Gladwyn and her tribe. Although Catharine and Gladwyn do have true love for each other, a critical reading of this story, specifically of Gladwyn’s inner monologues about the Native American woman, suggests intense feelings of dehumanization and exoticization, even provoking a sense of beastiality. Even though Gladwyn is physically and emotionally attracted to Catharine as a human, his upbringing and pre-existing instinct to sterotype Catharine as a white male in the 1800s causes him to view her in a lesser, and animalistic way. 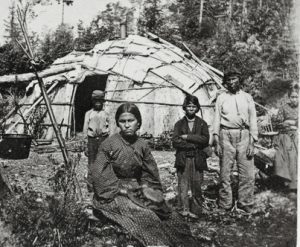 To Europeans and recently settled Americans, Native Americans were thought of as savages, beings that did not possess human qualities, sophistication, or to some, even the same biology as a human. Native American’s were thought of lesser because of their skin color, their way of life, language, and religion. During his first encounter with Catharine, Gladwyn develops feelings for her, but cannot help but view her as something entirely different than him, remarking, “there stood an Indian girl… Undoubtedly there were variations of Indian physique and color as there were albinos among deer…She was not unpleasant to look at, especially when a man was separated from his home and womankind by leagues of forest. ” (241-242). At first glance, Gladwyn immediately recognizes this woman and Indian, and separates her from the category of “womankind”, automatically dehumanizing her. Although he is attracted to her and the fact that she is possibly of Native American and European descent, she comes even more intriguing and exotic, making her more of an object. We can also see from Gladwyn’s description that he directly relates Native Americans with animals, in this case an albino deer, suggesting that not only does he see them as inferior as humans, but as beings in their evolution. As his feelings for her develop, Gladwyn begins to consciously try and move away from dehumanizing Catharine in order to justify his intense feelings for her. One day when Gladwyn sees her at the post, he, “treated her as he would a wild animal he had caught-tried to grin her confidence and make a pet of her. She was something more, however, because she was human. Her personal appearance reminded him of a white maiden he had known at home. She was a pet, so she must have a name. She was human, so she must have a human name (243). Glaldwyn’s association of Native Americans and savage beings is still so strongly engrained in his mind that he must make conscious efforts to carry out basic acts and gestures that all humans deserve as basic rights. Although it is still unethical, racist, and sadly, a normal outlook on Native American’s in this time, Gladwyn proves that love does have the power to overpower discrimination. Even with this realization, the two both lose their lives as a result of the rest of their respective people disagreeing with this fundamental truth. This entry was posted in Charles Waterman, Resistors and tagged British Invasion, French-Indian War, Fur Trading, Love Story, Ojibwe, Romance, Seneca, Short Story, Song of Hiawartha, Wisconsin. Bookmark the permalink.